Isn’t ‘Compassionate Conservatism’ An Oxymoron These Days? Posted in: Blog, Conference Season, Conservatives, Government, PG, Politics, Rating, WordPress. Tagged: Britain, Cameron, Conservative, David Cameron, Politics, Prime minister, Tories, Tory. From a party that wants to cut Welfare by £10billion, isn’t it a little two-faced for the Tories to claim they’re policies are the best way to help thee poor, the weak and the vulnerable? 16 Is Where The Voters Are At!! Or Will Be!! Posted in: Blogger, Government, Politics, WordPress. Tagged: Ed Miliband, Education, Government, Labour, Labour conference, Manchester, Teens, Tory, young people. Posted in: Blog, Conservatives, Government, Labour, Lib Dems, Politics, WordPress. Tagged: Conservative, David Cameron, Gordon Brown, Labour, Lib Dems, Nick Clegg, Politics, Tony Blair, Tory. My former-self has a habit of popping-up at the most inappropriate moments. Usually when I’m watching something on the news (I’m a real news-hound these days! ), and often when a certain politician appears on-screen. Now, I’m a bit of a politico on the side, and this certain politician – let him remain nameless, but he could do with blowing his nose – really pulls the arrogant sod out of me. I’ve undergone a change, a did a 180 degree turnabout from what I used to be. As a youth I was probably the most arrogant person you could meet. 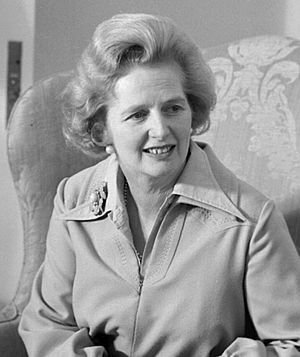 I’m not sure if I’ve said this in my posts, or if it’s just in my bio, but I was a Conservative in the 80s (not a card-carrying-one I might add), but I believed the guff that Saint Margaret T proclaimed with all the relish and zest of a Young Tory Entrepreneur. I believed the stuff about the unions trying to run the country (via the Labour Party), and I even accepted the stuff about the Conservatives having the answers to the economy problems of the 80s. My love affair with Tory politics came to ahead in the 90s when I woke up to the mess they had left behind them. And with the revelation of my own naivety, I lost faith in the Tory party totally. I have to say that New Labour just felt like a watered-down version of the old Tory standards to me (with a sprinkling of socialism thrown in to keep the masses happy). Tony B (or Almost-Tory Tony, as I think of him) never hit the spot for me. I couldn’t get past the insincere grin I’m afraid; but that’s just me – and my Labour-hating former-self – I suppose. So the New Labour run parliament with Tony and Gordon B didn’t make me feel any less like I was in an alternate-conservative reality – a bizarre trip into the political looking-glass. 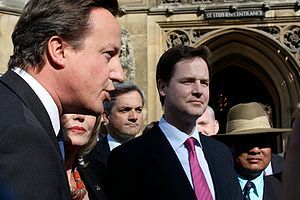 Now we have this unnatural coalition between Cameron’s cronies and Clegg’s crowd. 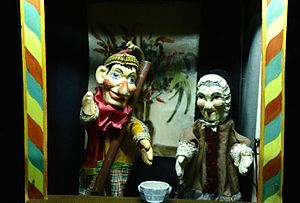 They are like a political Punch and Judy show with Dave as Mr Punch and Nick in the role of Judy (and Eddy M as the crocodile snapping at their heals). Could there ever be a more mismatched-marriage than the Conservative/Lib Dem coalition government? It’s as crazy as fish fingers and custard! Or a punk in parliament. Hopefully, in a couple of years, when we go back to the poles we might have someone that’s worth voting for. Currently, they’re all a bunch of no-hopers for Britain’s future. i-Views: 51% Lib Dems Are Dissatisfied with Clegg as Leader! Posted in: Conservatives, Government, Labour, Lib Dems, Politics, WordPress. Tagged: Coalition, Brighton, British, Clegg, Conservative, David Cameron, Government, Labour, Lib Dem, Lib Dems, Liberal Democrat, Nick Clegg, Politics, Tory, Wikipedia. Nick Clegg takes a battering in the latest (Mori / Ipsos) poll; 66% of those voting were unsatisfied with him. This isn’t exactly news for anyone that lives in the UK. Clegg’s popularity has dropped steadily since the election. Posted in: Blog, Blogger, Education, Finance, Government, PG, Policing, Politics, Rating, Self-esteem, WordPress. Tagged: blog, Education, Finance, Lib Dems, Nick Clegg, Policing, Politics, Self-esteem, Tory. 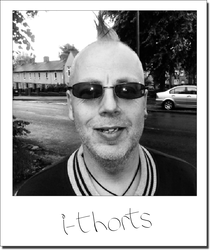 Re Posted from instant thorths. I’m getting old. I must be. All I see around me is heartache and pain. Idiots and morons. Does no one care anymore? When I was a lad we cared. We cared about music and girls… we cared about politics and fashion… we cared about life and death… we cared about freedom and justice… we simply cared.